Hi guys, in this post I will explain how can you use “High-Performance Tree” created by Lyssa Adkins. This exercise is deeply described in the book: “Coaching Agile Teams: A Companion for Scrum Masters, Agile Coaches and Project Managers in Transition” by Lyssa Adkins. This exercise can be found in the book: “Getting Value out of Agile Retrospectives”, a book written by Ben Linders and me with the foreword from Esther Derby. The book can be downloaded by free in LeanPub.com or InfoQ.com, please download it and spread it to your colleagues. This is a great exercise to help a team to define a vision for themselves. 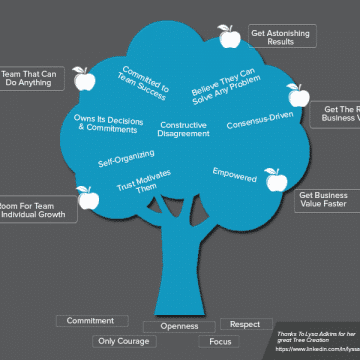 Lyssa referred in her book: ´ “metaphors” are a core skill that is taught in professional coaching courses.´ This is exactly what High-Performance Tree is, a metaphor to help teams to create a compelling vision for themselves; a way to create a path that leads to High-Performance teams. This exercise helps many teams to find what are next steps to achieve High Performance; this is what we can expect with this exercise. High-Performance team is an exercise that can be used in several different ways by any team, but because depending on a maturity of a team, the exercise will be used in a different way. We just need to define the maturity level of the team and adapt the exercise to it. Lyssa states that for a team to be highly productive, they need to have strong roots. When the roots are strong and solid, the tree can grow and flourish bearing beautiful fruits. This exercise starts with a coach drawing a tree of five Scrum values as roots; this is a great opportunity for the coach to teach or refresh a meaning of Scrum Values. Commitment is the state or quality of being dedicated to a cause, activity, etc. A commitment should never be broken, and if it is broken, it was not a commitment but an empty promise and a lie. In the Scrum world, this means that everyone involved in developing a product is committed to working towards a common objective. Courage is the ability to confront fear, pain, danger, uncertainty, or intimidation. In software development, all these feelings will always be present, and it is up to team members to try to dispel anything that prevents them from being successful. Openness is the ability to be open to new ideas, new approaches and new ways of working. This is a fundamental state of Agile software development because every day teams encounter different problems that need to be approached differently; being open is mandatory for achieving success. The focus is the process of selectively concentrating on one aspect of the environment while ignoring other things. In software development, this means that teams should completely concentrate on one topic at a time, they should not start a new topic before finishing a previous one. Respect is a feeling of deep admiration for someone or something elicited by their abilities, qualities, or achievements. In Scrum all team members interact closely; respect is mandatory for such relationship to work. After listing and explaining the Scrum Values, you can start recording characteristics of high-performance teams, like for example: Empowered, Consensus-Driven, Self-Organised, Constructive Disagreement, etc. 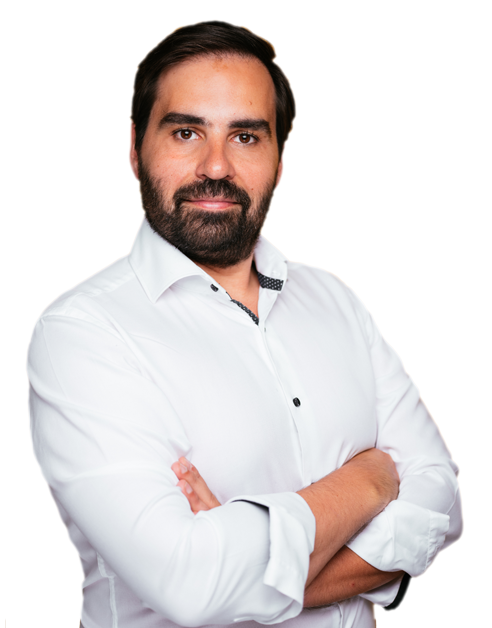 You can continue the exercise explaining that as a result of this combination there will be teams that can do anything, get astonishing results, get a right business value, get business value faster, etc. A possible example can be seen on the picture on the right. I truly believe this drawing will be a fantastic tool to be used in several retrospectives. New teams will be aware of what they need to be a high-performance team. Teams that are already together for some time can come back to the picture and analyse what is missing to become high performing teams. I believe the same applies to teams that are already performing as High Performing teams; they will always find some things they can improve. Like many other exercises that I explained before, this exercise will have a big impact when all team members are collocated. However, this is not mandatory; this is an exercise that can be easily done using a web cam like for example, Lyssa did here. What do you think? Do you think this is useful? Please give me some feedback. Very useful metaphor, I use it every time I start a new team. 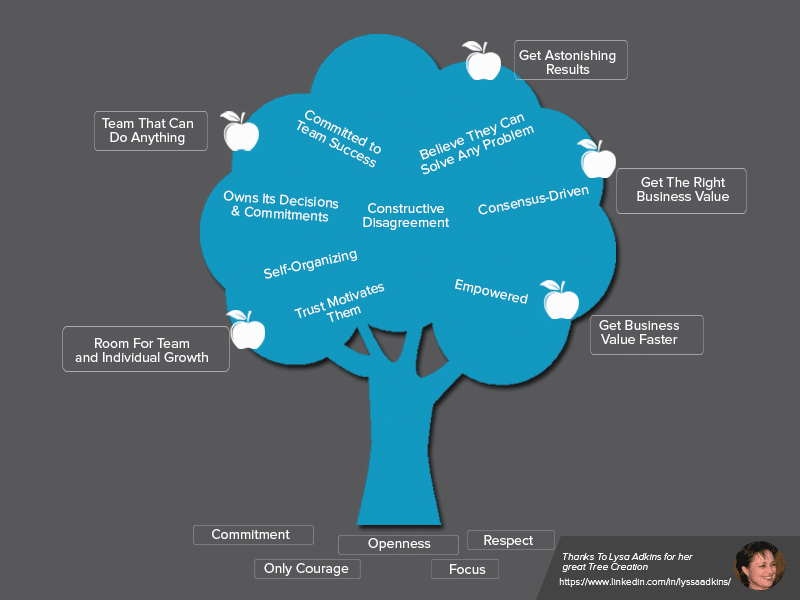 High performance tree and shu-ha-ri are my first talks to new agile teams. By the way I will be in Montreal in 3 weeks time, should we grab a beer? Nice one. It’s a good metaphor and can be used even further throughout the sprint and journey of becoming a high performance team. How do you embed it in your retrospective? Do you pick one of the core values and check what you already achieved and what’s necessary – and is this the connecting between roots and leaves? Coaching Agile Teams by Lyssa Adkins is one of the good books our there that every agilist should read. Thanks Luis for putting this together – very helpful! Great exercise! Used it for a recent retro and went a step further to post it visibly for our team in our working area. As sprints progress, we can add additional skills we want to work on towards becoming a greater high performing team. Thank you Luis for your information! I was thinking if this exercise, with adjustments, also could be used in a culture workshop for an org? The roots are are the core values that guides us, our mindset, the leaves are the factors that drives us, the success factors for high collaboration, and finally the fruits are the effect, the results we get when we nurture the tree. I am planning to do this with small groups, merge everything into a master tree and use dotmocracy to shape the tree. The result will be the org’s re-sharpened culture values.